After launching its search for the world’s most creative video last month, YouTube is now giving anyone and everyone around the world a chance to become a film maker and show their product at the next Sundance Film Festival. The project is called ‘Life in a day’ and YouTube has brought on board 2 Oscar wining directors, Ridley Scott and Kevin Macdonald, as executive producers with the Sundance Film Institute providing the showcasing platform. YouTube has selected 24th 0f July 2010 as the day to be filmed from your perspective in any way you like. It could be a chronicling of your own life in those 24 hours or anyone else’s; there are no rules or restrictions. Film anything or anyone on this particular day and upload the footage to YouTube by July 31st. The length of the footage should be from 15 seconds to 2 hours. A historic cinematic experiment that will attempt to document one day, as seen through the eyes of people around the world. 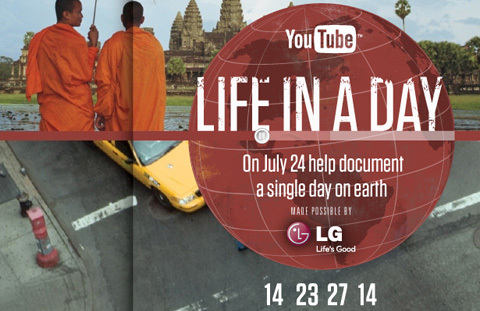 On July 24, you have 24 hours to capture a snapshot of your life on camera. You can film the ordinary — a sunrise, the commute to work, a neighbourhood soccer match, or the extraordinary — a baby’s first steps, your reaction to the passing of a loved one, or even a marriage. It must be made clear though that there is no monetary reward on offer but plenty of glory and respect from around the world and a chance to stand with the best of the best film makers at the 2011 Sundance Film Festival. So get your cameras ready and start the countdown to the 24th of this month.